Laureate Languages is delighted to share the first paper in the the Language Education in Review series, published in partnership with The International Research Foundation for English Language Education! 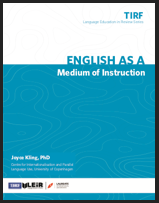 English as a Medium of Instruction (EMI) is an increasingly popular topic in the Laureate network and beyond. This paper provides an overview of EMI as well as its implications.